The largest of the three Cayman Islands, Grand Cayman measures about 75 miles and located at the southwest of Little Cayman and 90 miles southwest of Cayman Brac. It composes an estimated 76% of the entire peninsula. At its widest, the island is about 22 miles long and at its widest is around 8 miles. The Seven Mile Beach is a public beach famous for its crystal clear waters. Many travel blogs and magazine awarded Seven Mile Beach as of the Caribbean’s best beaches. Located north of George Town, many of the tourists who visit the place would snorkel or dive to see the beautiful underwater spectacle up-close. Restaurants, beach bars, and a playground lined up along the Seven Mile Beach. Aside from its white sand, the crescent shape island also has perfect calm waves suitable for families with smaller children. Dogs are able to run free in the beach to enjoy all day of play. 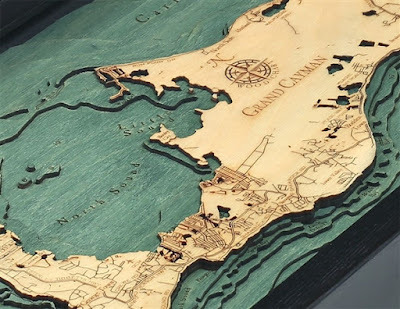 https://www.carvedlakeart.com/san-diego-wood-nautical-chart-map-p/sdgo-d3l.htm Check out carvedlakeart if you want the best deals on laser cut map, wood nautical chart in Grand Cayman Island, wood topographical map, and charts of the lakes, streams and oceans of the world. If you want to get temporarily away from the crowded beach and explore more of the island, then put Mastic trail on your itinerary. Bring out the nature lover in you and discover more of Grand Cayman Island. This 200-year-old trail has a gravel path that goes through a mangrove swamp and a woodland area which is about 2 million years old. Mastic Trail houses the most beautiful and rare plant life on the island. There are two trails for tourists; one is a flat trail for beginners and the other one is for the more adventurous spirit. Hikers would rate this trail as quite a challenge but the view will leave you breathless. If ever the surface water bore you, which seldom happens, head south of the Seven Mile Beach and you will find the Eden Rock and Devil’s Grotto. Two of the most famous diving spots on Grand Cayman, the two are filled with the underwater labyrinth. Colorful including parrot fish, silversides, tarpon, and barracuda take refuge in this diving spots. The great things about in these two diving spots are the areas designated for both beginner and intermediate snorkelers. When Christopher Columbus landed on the Cayman Islands, he saw thousands upon thousands of the green sea turtles. It was such a sight that he even named the islands as Las Tortugas. No less than 7,000 green sea turtles still are living today at the Cayman Turtle Farm along with other species of fish, birds, and sharks. However, in recent years, the green sea turtles population declined and now considered as an endangered species. One of the main goals of the Cayman Turtle Farm is to protect the Tortugas and to increase their population. The farm works diligently to protect the green sea turtles and other threatened animals on the island. People of all ages, especially families with little kids will enjoy a butterfly garden and a nature trail. There’s even a restaurant on-site so you don’t need to worry to bring that much food or water. The highlight of the tour is the up-close encounter at the green sea turtles and letting tourists hold the baby sea turtles. Booking a tour of the Cayman Turtle Farm is both fun and informative for everyone. While touring Grand Cayman Island, try to drop by at the Bakers National Park. It’s the first national park in the Cayman Island and a great place for cycling, kite surfing, cycling and horseback riding. Take note that the island does not have any kind of amenities, so be sure to bring snacks and lots of water while doing any activities on the beach. Bakers National Park is secluded and often deserted, it’s the best spots away from the usual touristy crowd and full packed beaches. To go to the national park just follow the road to Conch Point Rd, look for the Pappagallo restaurant to know you are on the right track. Then head east, gravel road and through the gate. There’s a sandy road that goes through the park and after a few minutes’ walk, you will be able to see the reef-protected shore.